What’s the point of a teacher’s manual, anyway? It’s an answer key, of course, but sometimes we let this important tool become the master of our homeschool. Have you made the mistake of letting your teacher’s manual boss you around? Sometimes it’s so easy to let someone else be the boss - even when that someone else is a book. It happens for a few reasons -- when we’re new to homeschooling or if we aren’t confident about the subject we’re teaching (or we overcompensate and purchase TWO programs for one subject… but that’s another lesson). It even happens when we don’t take the time and effort to master the material ourselves. Whatever the reason, it’s so easy to let that teacher’s manual tell you what to do. Then it becomes your master (or a common phrase in the homeschool circle -- you become a slave to your curriculum). I don't know about you but I'd rather not have a book tell me what to do. But what's the big deal? Why is this a problem? When you put the teacher's manual in charge you move into auto-pilot mode. You don't really think about your kids and what they need or how they learn best. You become a 'box-checker' -- doing every single assignment and requirement the teacher’s manual tells you to do. Those higher ideals and goals you once held get lost in the daily grind while you're busy doing whatever the teacher's manual requires of you. When you finally look up from that teacher's manual you may be surprised to discover a few things. Your kids could follow your example and just move through their homeschool assignments without the excitement they once had (after all, they're just following your example). If you really took the time to consider them, you may even discover that your kids don’t need to do every worksheet and assignment that is included in the program. Even if the teacher's manual requires it. If your kids understand a concept - why would you want them to continue doing the same thing over and over just because the teacher’s manual suggests it? Teacher’s Manuals can actually sabotage your homeschool if you aren’t intentional about using them. 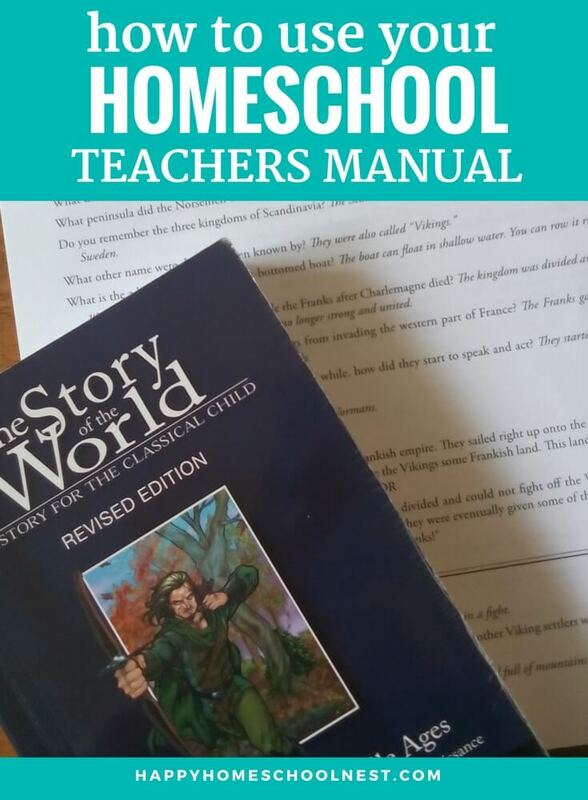 Read this post for more ways a teacher’s manual can sabotage your homeschool. Now that you know why the teacher’s manual shouldn’t be your master, how should you be using that book? You can and should depend on them -- they can be a great resource and tool when they are used correctly. Besides using them as an answer key, there are a few other useful ways to use your investment. A good teacher’s manual helps you become a good teacher. It offers explanations and advice about the subject you’re tackling. They are great for the new homeschooler who is unsure of herself. Read the notes, study the lesson material, and use it as a guide for your own teaching. Use your teacher's manual to get excited about the content and convey that excitement to your kids. The key to all of this? You need to find the right teacher's manual for you. A tip: you should find a program that makes you a fabulous teacher. Once you do that, you can teach with confidence! Ignore your child's learning style for a few moments and focus on finding resources and programs that help you teach first -- then you'll be prepared to present the material in a way that best suits your child. Another fabulous way to use a teacher’s manual is to create your own unit study. It can become the ‘spine’ for your program. Use it to find other helpful books and resources. Read the notes and content to familiarize yourself with the material and that research will pay off when you're planning the unit. Sometimes you just need a change of pace in your homeschool and adding a unit study can be just the thing to add some interest and variety. Pick your topic, find a book or two that will help you learn more about the topic (your teacher’s manual fits the bill! ), add a few interesting activities and projects and you’re set. The teacher’s manual shouldn’t be your boss. You’re in charge of your homeschool! Have you made the mistake of letting the teacher’s manual become your master? But I want to know how you turned it around. What made you realize that you didn’t have to be a slave to the teacher’s manual? Leave a comment and tell us about your experience!